Descriptions: A set of 4 stamps which have not been cancelled by datestamp. Established in 1863, the International Committee of the Red Cross (ICRC) is an impartial, neutral and independent organisation whose exclusively humanitarian mission is to protect the lives and dignity of victims of armed conflict and other situations of violence and to provide them with assistance. The ICRC also endeavours to prevent suffering by promoting humanitarian law and universal humanitarian principles. The ICRC is at the origin of the Geneva Conventions and the International Red Cross and Red Crescent Movement, assisting countries all over the world to implement the Geneva Conventions of 1949, which protect wounded and sick members of the armed forces, prisoners of war and civilians in times of armed conflict. To mark the 150th anniversary of the ICRC, Hongkong Post issues a set of commemorative stamps portraying the four pillars of ICRC action, namely, protection, assistance, prevention and cooperation, to commend the ICRC for its humanitarian contributions. The ICRC's protection efforts are intended to benefit two categories of persons in particular: those who have been arrested and detained in the framework of an armed conflict, and civilians who are not or who are no longer participating in violent confrontations, especially children, women, and elderly, handicapped and displaced persons. The objectives are to protect lives, maintain dignity, and preserve family unity as well as the physical and mental well-being of those affected. The ICRC provides emergency aid and health care for those affected in an armed conflict as well as helping ensure continuity of basic health services, disease control and emergency care in local healthcare facilities. In addition, the ICRC ensures that civilians in conflict zones maintain a sustainable living, with a view to reducing death and suffering due to damage of habitat or living facilities, for example through the maintenance of sanitation and water supplies. The ICRC strives to enhance preventive efforts in order to alleviate suffering caused by armed conflicts. Apart from constantly reminding local authorities and parties concerned in armed conflicts to comply with international humanitarian law and international human rights law, the ICRC also continues its worldwide educational activities to enhance young people's understanding of international humanitarian law and humanitarian actions, and to arouse awareness about violation of humanitarian law. The ICRC works closely with the National Red Cross and Red Crescent Societies to ensure rapid, rational and full support and assistance to the victims of armed conflicts. Moreover, the ICRC also helps in National Societies' capacity-building by rendering professional support, ranging from promotion of international humanitarian law and provision of emergency aid and health care to restoration of family links. 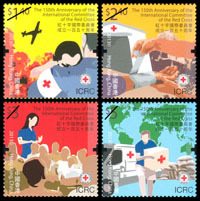 This set of four commemorative stamps in vibrant colours and simple designs depicts the four pillars of ICRC action. Perforations in the shape of a cross are used for the first time to highlight the emblem of the ICRC. Stamp products include mint stamps, stamp sheets, souvenir sheet and presentation pack. Serviced first day covers are also available at the philatelic offices on the issue day only.